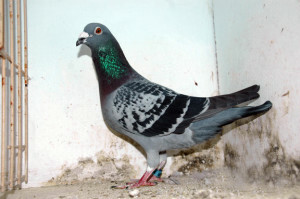 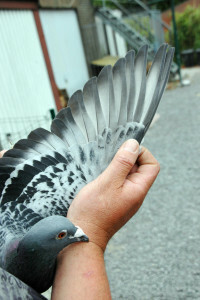 B13-3145768, BROTHER FAVORIET, bred by Antoine and Rudi De Saer, from their superpair SIRE : B09-3040476, "CHAMPION" , full brother superstar "BLEKEN" , 4th National Ace long Distance, 2nd Tours 2.739 birds, 16th Souillac National 7.045 birds, 47th National Tulle 6.659 birds, 66th National Limoges 10.448 birds .... 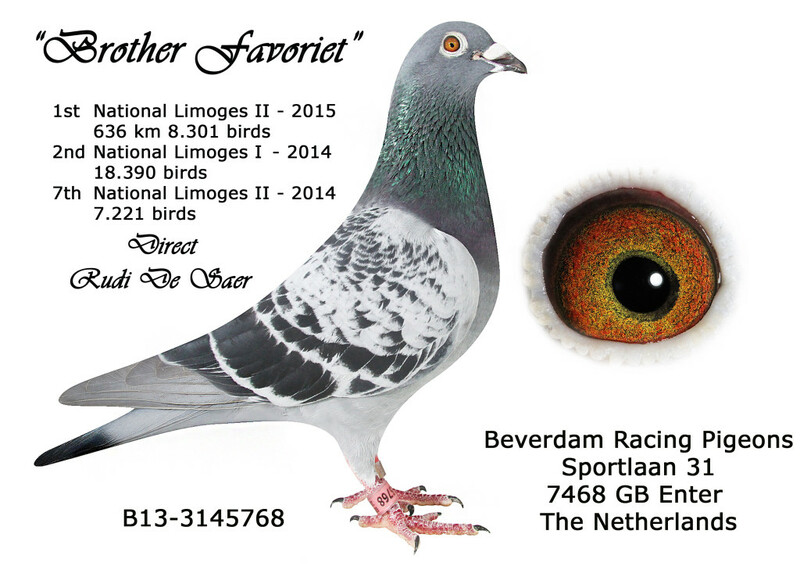 Brother "TOURS" , 6th Tours 2.898 birds, 3rd Tours 2.739 birds.....from B98-3240118, DEN "18" , GRANDSON WITTENBUIK, super producer and B05-3177035, 't GOEDJE. 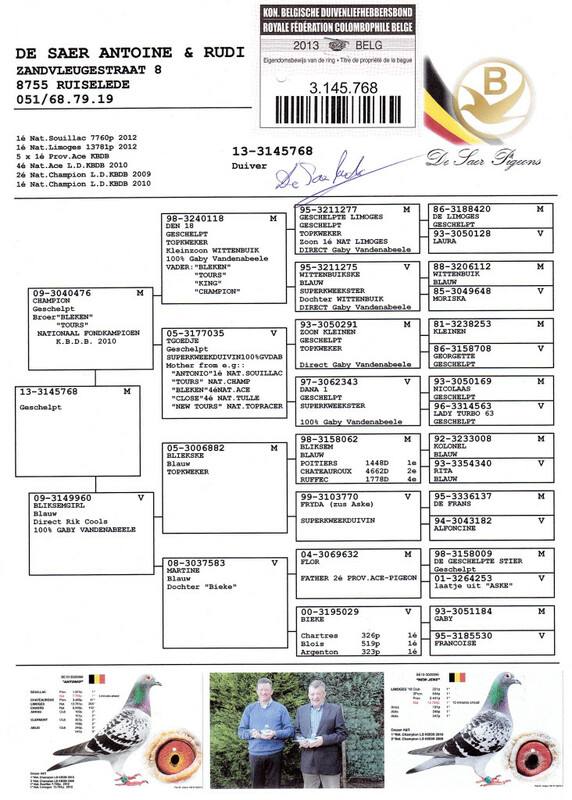 Dam is 09-3149960, "BLIKSEM GIRL" , granddaughter "BLIKSEM", from B05-3006882, "BLIEKSKE" and B08-3037583, " MARTINE", daughter BIEKE, from Rik Cools and also 100% Gaby Vandenabeele. 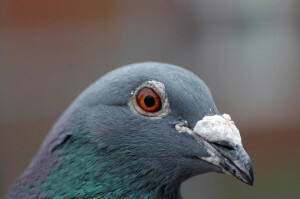 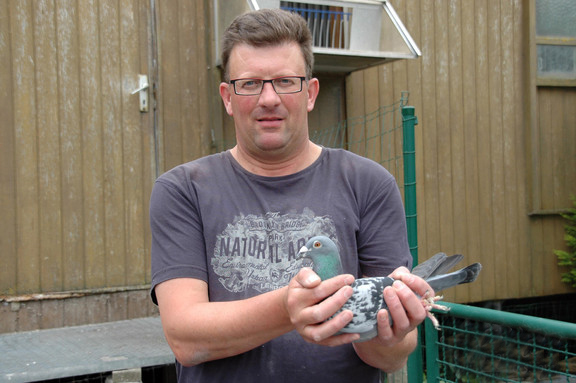 7th NATIONAL LIMOGES II 2014 against 7.221 birds, 40th National Chateauroux 15.902 birds, 41st National Souillac 5.284 birds, 54th National Argenton 8.467 birds, 69th National Tulle 7.350 birds, .....................simply the very best racing under the sky.